Designed as an introduction for tort law students, this book offers a probing analysis of basic concepts and an examination of the everyday human problems that this area of law addresses. 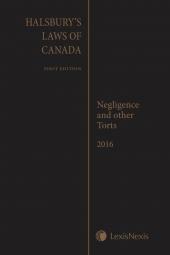 The authors guide students through this vital aspect of the Canadian judicial tradition. Designed as an introduction for tort law students, this book offers a probing analysis of basic concepts and an examination of the everyday human problems that this area of law addresses. The Honourable Allen M. Linden and Professors Lewis N. Klar and Bruce Feldthusen bring to bear a wealth of experience in the classroom and from the bench to guide students through this fundamental aspect of the Canadian judicial tradition. Lewis N. Klar, Q.C., B.A., B.C.L., LL.M., is a Professor Emeritus at the University of Alberta, Faculty of Law. He was the Dean of Law from 1997 to 2002 and was with the Faculty of Law from 1973 until his retirement in 2014.. He was admitted to the Bar of the Province of Québec in 1971 and the Law Society of Alberta in 2000. He was awarded a Queen's Counsel in 2002, and received the Distinguished Service Award for his contribution to legal scholarship from the Law Society of Alberta and the Canadian Bar Association (Alberta) in 2005. In 2007, Professor Klar received the University of Alberta's J. Gordin Kaplan Award for Excellence in Research, the university's most senior and prestigious research award. In 2009, Professor Klar received the Hon. Tevie H. Miller Teaching Excellence Award, the Faculty of Law's annual teaching award. Professor Klar received the prestigious John G. Fleming Award in Torts from U.C. Berkeley Law School in 2016. Professor Klar is an elected member of the American Law Institute. He served as a member of the Alberta Auto Insurance Rate Board from 2005 to 2013. 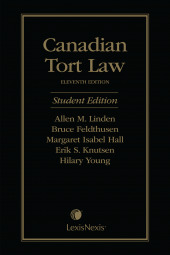 His major publication is Klar, Tort Law (2012), which is currently in its sixth edition. He has published numerous articles on the law of torts and has presented his work at conferences in Canada, the United States, Scotland, Japan and Australia. He has taught at a large number of continuing legal education programs for both lawyers and judges, and has been a consultant on a number of important cases both in Canada and the United States. His works have been cited by the Supreme Court of Canada and the courts in every province in Canada, as well as by courts overseas. 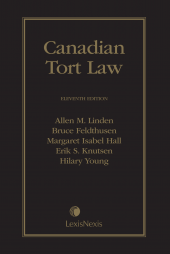 In recognition of Professor Klar's contributions to tort law, a Special Edition of the Alberta Law Review was published in 2016 in his honour.